Minister of Business, Dominic Gaskin and Prime Minister Moses Nagamootoo speaking with the media aboard the United Kingdom’s naval vessel, HMS Mersey. Instead, Nagamootoo suggested that the prominent businessman had been handed the job by Minister of State, Joseph Harmon who was up to recently on an overseas visit to China. Hours after the Ministry of the Presidency announced in one sentence that Tiwari’s appointment has been rescinded, Prime Minister Nagamootoo and Business Minister, Dominic Gaskin said they had only learnt of Tiwari’s appointment and its revocation through the media. While Tiwari’s appointment was never announced by the Ministry of the Presidency, that same government agency announced the decision to scrap the portfolio in the one-sentence statement. 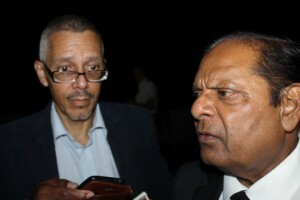 Gaskin and Nagamootoo could not say definitively why the appointment was made. Nagamootoo, however, noted that Minister of State, Joseph Harmon could make an order for certain appointments as had been done by the Head of the Presidential Secretariat. “I am not aware of how the appointment took place and who actually did that appointment,” Nagamootoo said. because that might have been a requirement. “I need to find out if this was for a convenience. I understand a delegation had gone overseas and obviously it could have been a one-off delegation appointment to give the person some status in going to some negotiation or some sort so we need to wait and find out what were the actual circumstances that had required this person to have an appointment,” he said. Initially, the Prime Minister had declined comment on the issue and had asked that “this matter be raised” with President David Granger or the Minister of State. Shortly after news surfaced that Tiwari had been appointed ministerial advisor on business development, eyebrows had been raised in several quarters especially since his company had been named in the purchasing of government land and its subsequent sale to the Chinese company, Bai Shan Lin. 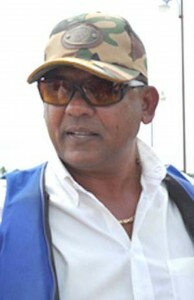 The People’s National Congress Reform (PNCR), under the leadership of then Opposition Leader Desmond Hoyte, had severely criticized Brian Tiwari’s BK International for his performance in the delivery of several infrastructural contracts.